Sunset Sky Loma Del Gato With ! 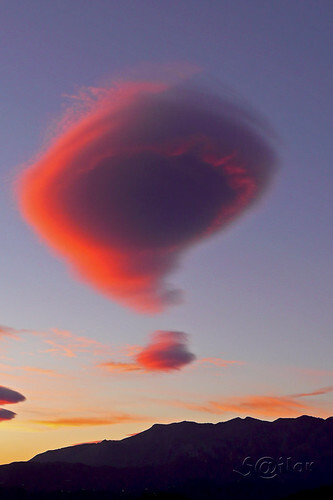 Lenticular Cloud (Altocumulus lenticularis), a photo by S@ilor on Flickr. This ! Cloud was captured at sunset from Loma Del Gato. I Have never seen a Cloud formation like this. It could also be a ? Cloud at Sunset. There were two more strange clouds on the sky. On the left you see a part of two clouds looking like flying dishes. (Altocumulus lenticularis) are stationary lens-shaped clouds that form at high altitudes, normally aligned perpendicular to the wind direction. Lenticular clouds can be separated into altocumulus standing lenticularis (ACSL), stratocumulus standing lenticular (SCSL), and cirrocumulus standing lenticular (CCSL). Due to their shape, they are often mistaken as Unidentified Flying Objects (UFOs). Where stable moist air flows over a mountain or a range of mountains, a series of large-scale standing waves may form on the downwind side. If the temperature at the crest of the wave drops to the dew point, moisture in the air may condense to form lenticular clouds. As the moist air moves back down into the trough of the wave, the cloud may evaporate back into vapor. Under certain conditions, long strings of lenticular clouds can form near the crest of each successive wave, creating a formation known as a 'wave cloud.' The wave systems cause large vertical air movements and so enough water vapor may condense to produce precipitation. The clouds have been mistaken for UFOs (or "visual cover" for UFOs) because these clouds have a characteristic lens appearance and smooth saucer-like shape. Bright colors (called Irisation) are sometimes seen along the edge of lenticular clouds. Pilots of powered aircraft tend to avoid flying near lenticular clouds because of the turbulence of the rotor systems that accompany them, but glider pilots actively seek them out. The precise location of the rising air mass is fairly easy to predict from the orientation of the clouds. "Wave lift" of this kind is often very smooth and strong, and enables gliders to soar to remarkable altitudes and great distances. The current gliding world records for both distance (over 3,000 km; 1,864 mi) and altitude (15,460 m; 50,721 ft) were set using such lift.